They don’t skimp on the famous writers, either: the line features Edgar Allan Poe, Jane Austen, Charles Dickens, Oscar Wilde, and of course the Bard. All well and good, but seriously, Accoutrements: where is the H.P. Lovecraft figure? I mean, this is a license to print money, folks. Lovecraft exists at exactly the right intersection between literary notoriety and pop culture adoration for an action figure like this. He could come with almost any number of Cthulhu-related accessories, from the Necromicon to the famous statue from “The Call of Cthulhu” to Randolph Carter’s silver key from, well, “The Silver Key”…I mean, this figure designs itself! Plus, Lovecraft has enough of a unique face that it won’t just look like a random guy in a suit–not any more than Seth Godin, anyway. And he’s an American author, so poor Mr. Poe won’t have to fend off all those limey Brits by himself. Do it for America, Accoutrements. I can see this figure flying out of a store like Newbury Comics. Hell, I’d preorder the thing, personally, and get one to open and one to keep on the card. I can’t think of any potential rights issues, since Lovecraft was a public figure–Arkham House can’t copyright or trademark a person. And the Necronomicon is famously a public domain idea, given its presence in about half of all horror literature and film in the last thirty years. H.P. Lovecraft is a great idea for an action figure. However, we do not take outside ideas… Here at Accoutrements, we have a great design team that works tirelessly to create all of our action figures (and the rest of our wacky stuff), and we are always working on new ideas. I hope you and your friends will keep an eye out for new ones in the future. What? “We do not take outside ideas”? I’m not pitching a screenplay here. I can’t sue you if you make an H.P. Lovecraft figure just because I mentioned it. The email was polite enough, but unsatisfying. Look, I just want an H.P. Lovecraft figure, Accoutrements. Make it happen. Please. Their Oscar Wilde figure is practially an eigth Doctor Who ready to go. And watch it with the Limey comments, we can't let you Yanks take all the credit you know, besides, everyone know's God is an Englishman. I'm in the middle of reading the Necromonicon collection (my first foray into Lovecraft) and would love this! 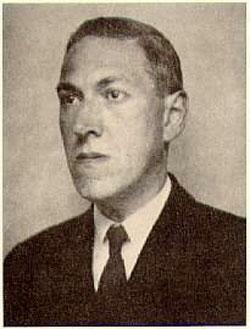 Funny,Lovecraft looks like Harold Ramis if you give him poofy hair and glasses. @Poe, no drama fella, pulling your leg! Where did you live over here? @fengschwing: Spent two months working in Aldershot for a media company, then spent a month travelling all over–Salisbury, Hay-on-Wye, Tintagel, York, Edinburgh, Manchester, a hop over to Dublin, and some significant time in London of course. I even got to walk around inside Stonehenge during the solstace ceremony that year (this was 2000). I remember there was this store chain in every city that let you rent Internet access by the hour…EasyAnywhere or something like that. Lots of orange. I always thought that place was cool. I think it's a neat idea, but I'm not sure a Lovecraft figure would sell like gangbusters. Though if he came riding the Cthulhu you might be on to something, haha. @Poe, not too far from Aldershot or Salisbury where I am, lovely bit of the country if I do say so myself, I'll pay your regards to it. I support this idea. I believe a letter writing campaign is in order…. Meh. I don't collect ironic action figures, which is ironic since I have a fondness for irony. Lovecraftian action figures would be most welcome here. I'd love to have an HPL figure – wow! As for Cthulhu Himself, we need a spring-action floor tile that pops open (like a Jack in the Box?) when sensors detect movement in the room. Cthulhu would then rise from beneath the floor, unfurl his many tentacles, and just ooze across the room! Hmmm, two life-sized HPL action figures can stand guard by the door to this room. Yeah, probably not a huge market for this kind of setup, but I'd definitely install it. My only question would be – which room? No outside suggestions aka fan pitches? I didn't know ToyGuru worked at Accoutrements too! Why not make it a two pack with Two Gun Bob himself Robert E. Howard? I still need to read that book I got about the two of them taking on the supernatural. See, as cool as I think some of Lovecraft's writing is, I would never buy a Lovecraft figure… for the same reasons I'll get other Transformers but have no interest whatsoever in owning ROTF Mudflap or Skids. I jumped to buy that awesome Cthulhu plushie that was released some years ago, and I'd love to see figures of the Great Race beings from "The Shadow Out of Time," but nope, I want nothing to do with a figure of Lovecraft himself.